Heather Rode has backgrounds in retail sales, management, and communications. She enjoys photography, baking, and selling antiques. Depending where you're from or where you grew up, you might call this easy dessert recipe "poke cake" or "Jell-o cake." Whatever you call it, it's always delicious. My mom taught me how to make Jell-o cakes, and I make them all year long. They taste incredible on a hot Arizona summer day. 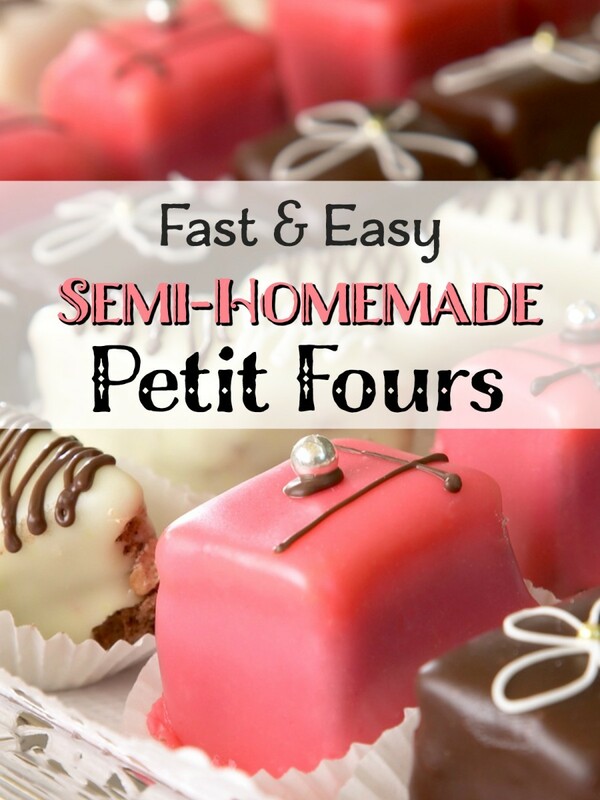 You can experiment with different flavors and combinations and really have fun with this idea. If it looks like it's hard or takes too long-- it doesn't. If you can follow a standard box cake recipe and boil water then you'll do just fine. What Kind of Cake Should I Bake Today? 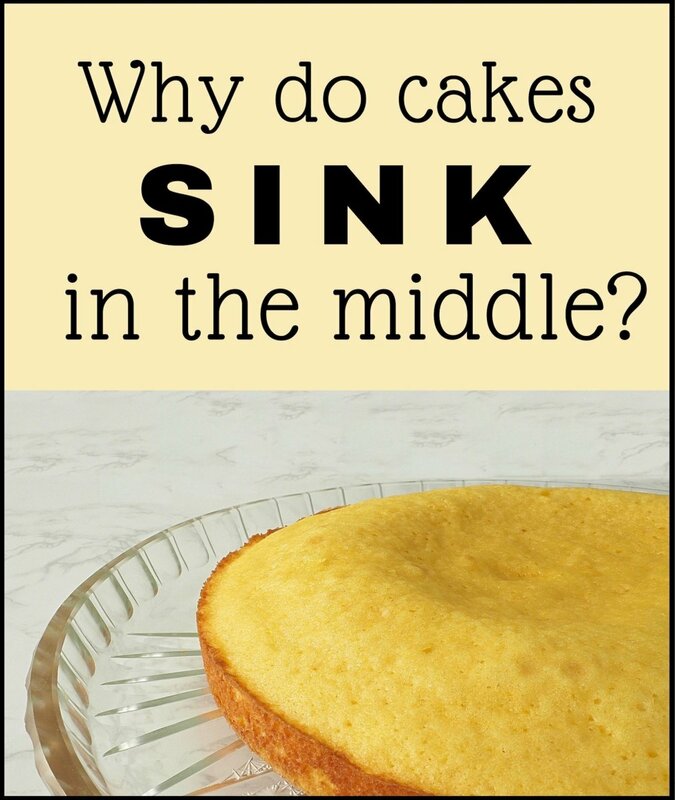 The cake pictures in the majority of this tutorial are a yellow Betty Crocker cake that I made. I like the contrast of color between a white cake mix and a dark gelatin. 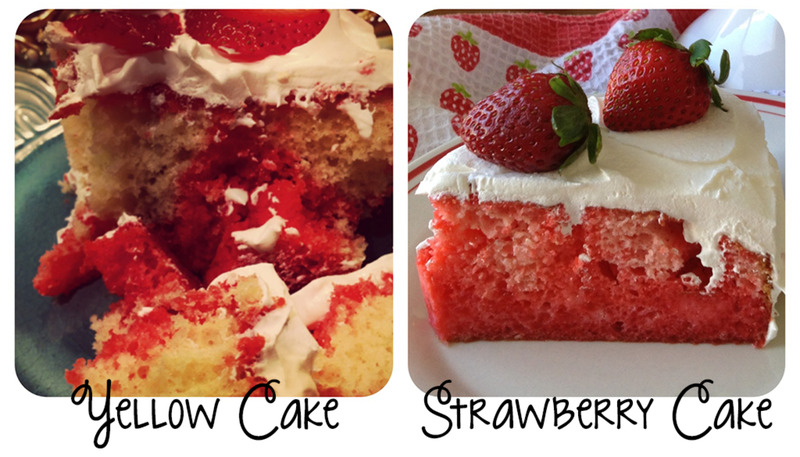 The cake on the right is a more recent dessert I made with a strawberry Pillsbury cake. The steps are exactly the same. 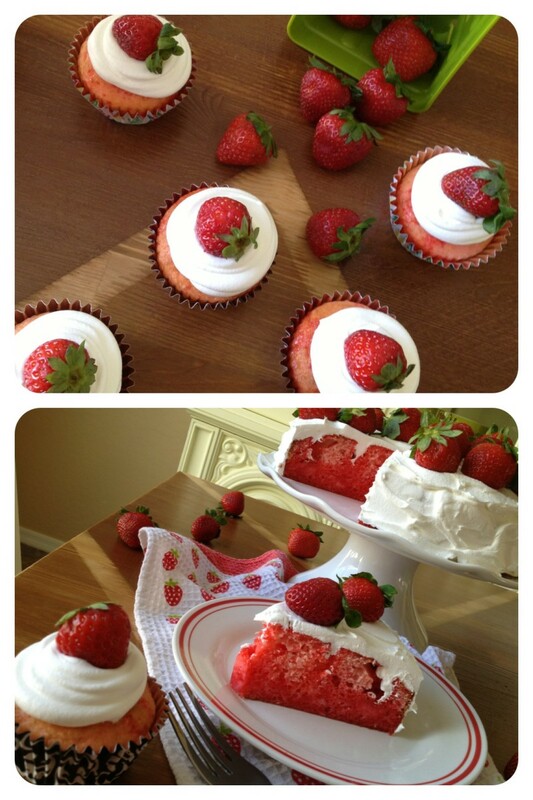 See bottom of page for info on making this dessert as cupcakes and for more pictures of the triple strawberry cake. Prepare and bake your cake mix according to the packaging. I usually use a white or yellow cake mix. 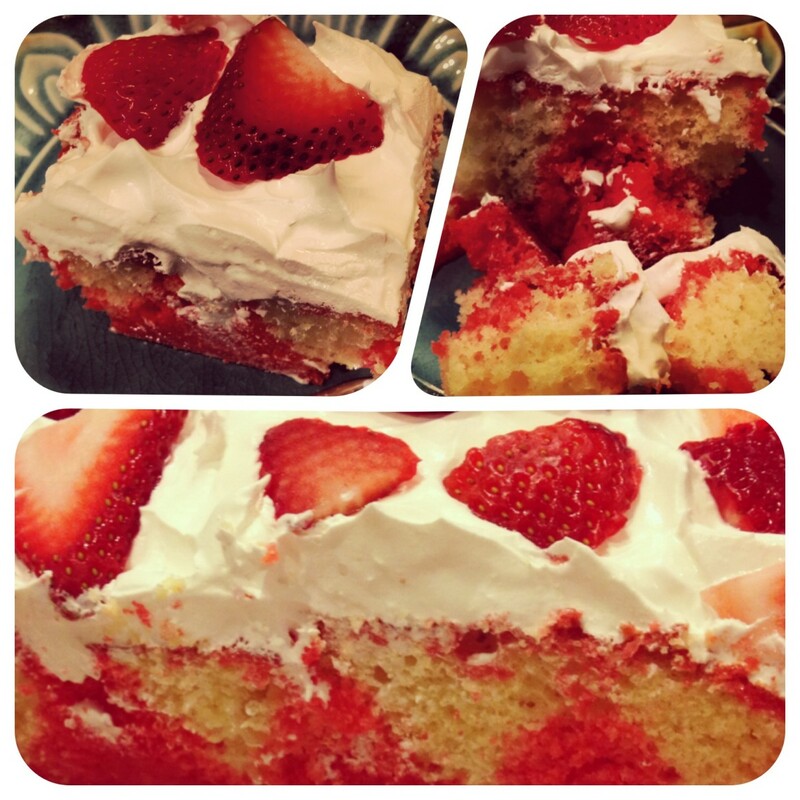 See bottom of page for strawberry cake mix version. I like to bake my cake in a clear Pyrex cake pan because I enjoy seeing this cake from every angle. 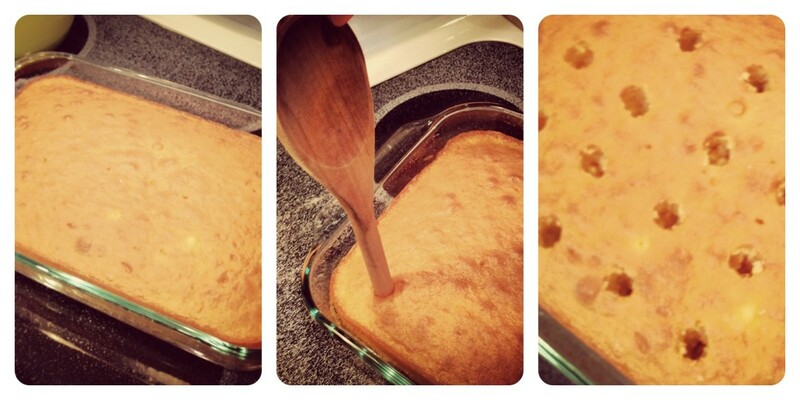 Once cake is 100% cool, use the handle/tip of a wooden cooking spoon to "drill" holes into your cake. Pierce cake, holding the spoon end and spin 360 degrees. Gently pull spoon out and repeat this step until your cake is full of holes. TIP: Don't try this step unless your cake is cool. Doing this to a warm cake will make mush out of it. Also, make sure your holes aren't too close together as this will also ruin the structural integrity of your cake. If your spoon is becoming clumped with cake residue, your cake is still to warm for this step. Prepare your Jell-o mix using the powder and only half of the water needed as described on the box. For example, if the Jell-o calls for one cup of hot water and one cup cold, just use the hot water (it helps dissolve your powder). 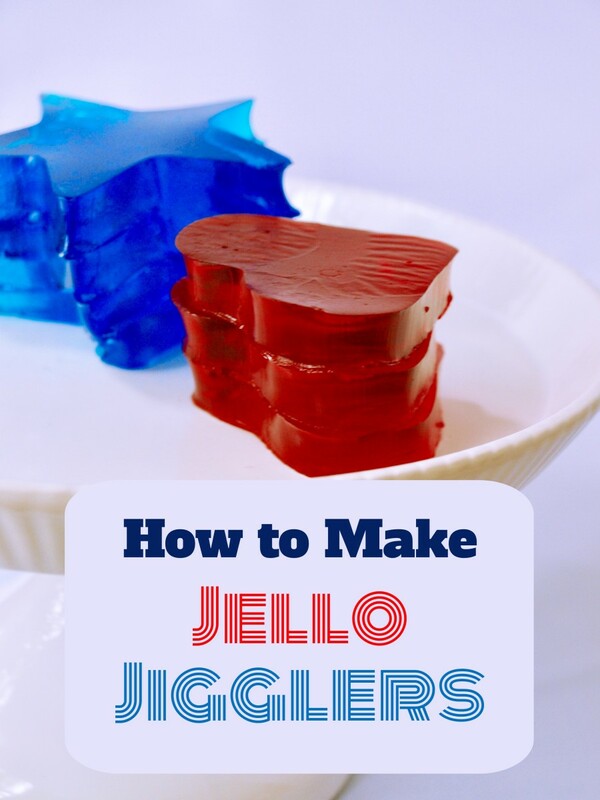 The larger boxes of Jello call for 2 cups hot and 2 cups cold. I used a large box for this cake and used 2 cups hot water. Stir with fork until mix is completely dissolved. I like to prepare mine in a large pyrex measuring cup to make the next step easier. 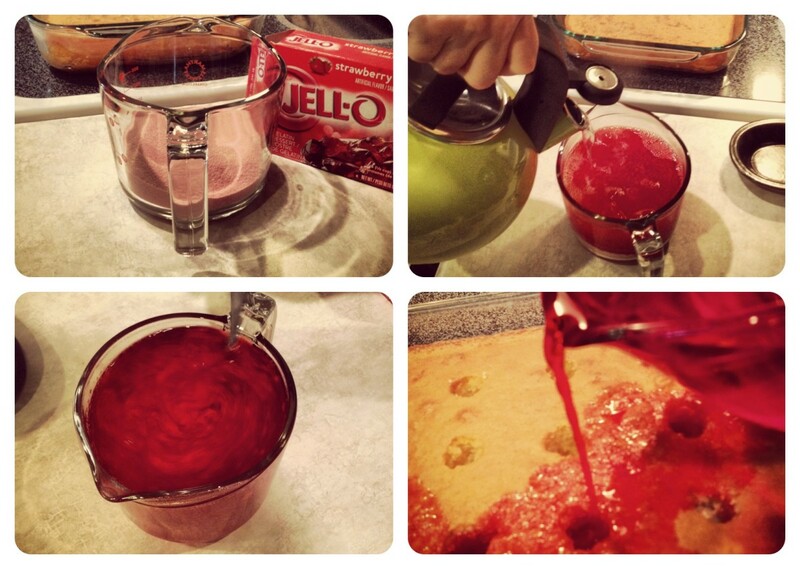 Pour your colorful Jello-liquid into the cake holes. I like to pour a little in each hole, to ensure coverage and if I have any left over, I repeat this step. Return your cake to the fridge to chill. Allow at least 2 hours. Eating it too early will result in a soggy mess. The cake needs time to absorb the liquid Jell-o and the Jell-o needs time to cool off and gel. 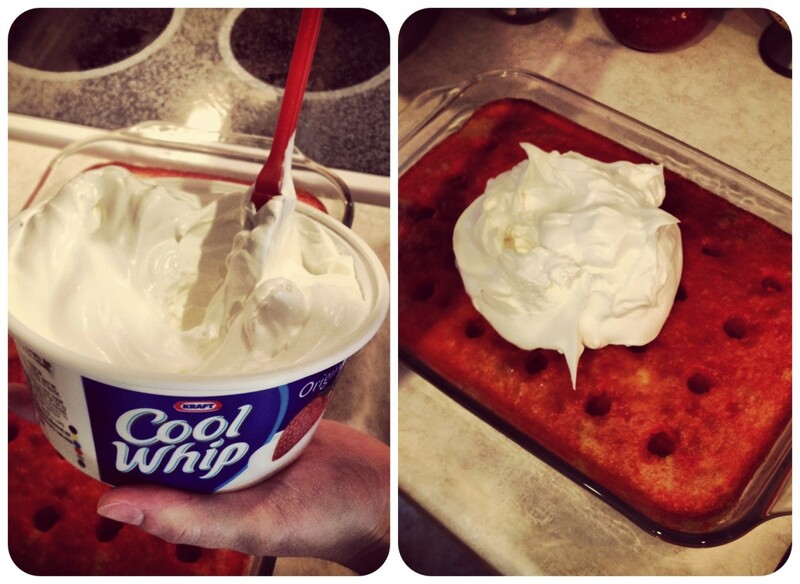 Frost your cake with cool whip or freshly whipped cream. Evenly frost your cake, taking care to cover any holes from previous steps. 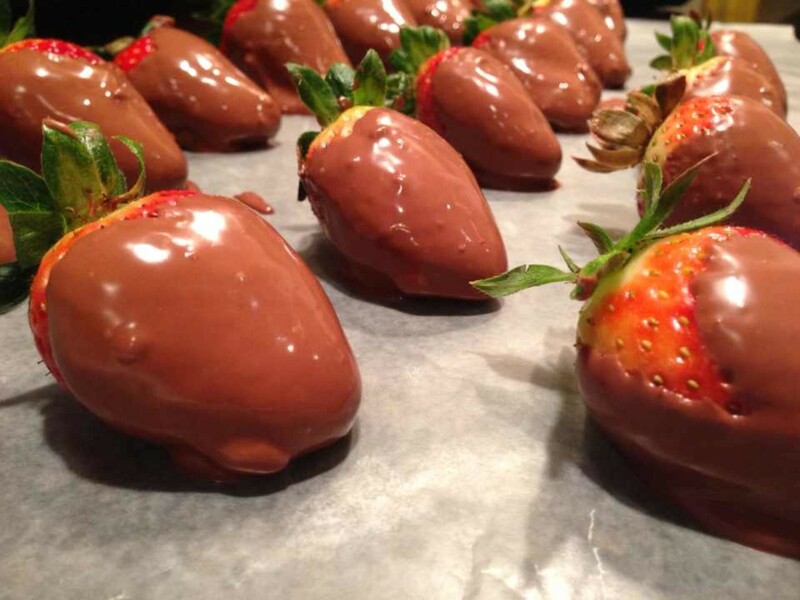 Decorate with fresh strawberries and serve immediately or return to frig to keep cold. 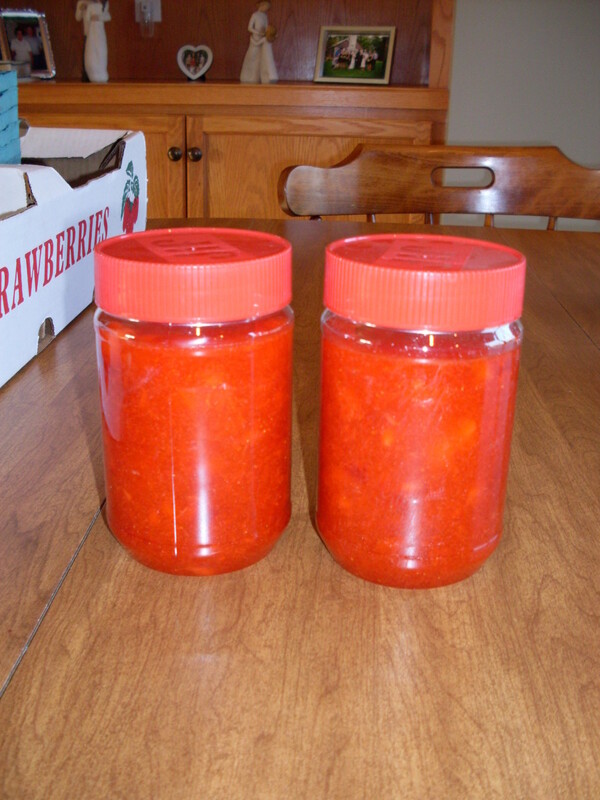 Keep refrigerated and cover leftovers to prevent drying out. Can I frost my Jell-o Cake a Little Early? For best results, you should let your cake fully chill. Even though you allowed your cake to cool between baking and poking, you also poured hot liquid into it right after. It needs to be cold and it will take a little while to get there. I've frosted a Jell-o cake or two before her time and it was not pretty. Your cool whip or freshly whipped cream topping will melt and get watery if your cake is not ready. Don't mess up all your hard work. For holidays, I like to do two colors (so two small boxes of Jell-o instead of a large one). For Christmas I have done strawberry (red) and lime (green). A 4th of July Jell-o cake uses a white cake mix with a red gelatin of your choice and blue berry-flavored Jell-o. If doing two colors, prepare the warm Jell-o liquid separately each time. Pour one color into your cake holes, alternating every other hole. 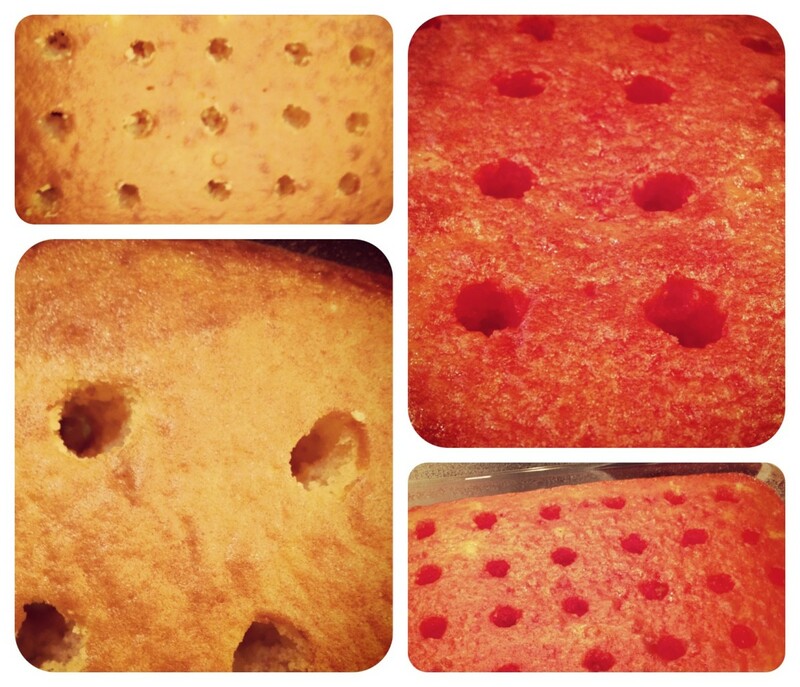 Repeat this step with your second color (flavor) filling the empty holes you skipped in the previous step. If you wish, you can poor both Jell-os into the same holes. The colors won't be as muddled as if you mixed them together prior to pouring. Avoid mixing colors if they don't compliment one another or if one color will significantly "take over" the other color. You can prepare this dessert as cupcakes too. Bake cupcakes in foil-lined cupcake papers (because they're stronger and they stop colors from bleeding through). Keep baked cupcakes in muffin pan for easy transportation purposes. When cooled, use the wooden spoon technique to "drill" a hole in the center of each cupcake and gently fill with some Jell-o liquid. Make sure to put a little liquid in each cupcake at first and then refill with seconds if needed. Refrigerate cupcakes for at least two hours before frosting and serving. Cupcakes will be spongy. Serve cold and keep refrigerated. For picture-perfect-cool-whip-frosted cupcakes make sure your cupcakes and whip are very cold. Stir cool whip in container to get rid of any clues that it's been sitting in a tub. Spoon into cake decorating/pastry bag or large Ziploc bag with a corner snipped off. Decorate in a counter-clockwise circular motion starting in the middle to build up height and working outwards. Top with freshly washed and dried strawberries. While most of my Jell-o cakes are rectangular and baked in Pyrex, I wanted to try something extra fancy with this cake. It's possible, but there are a few important tricks. 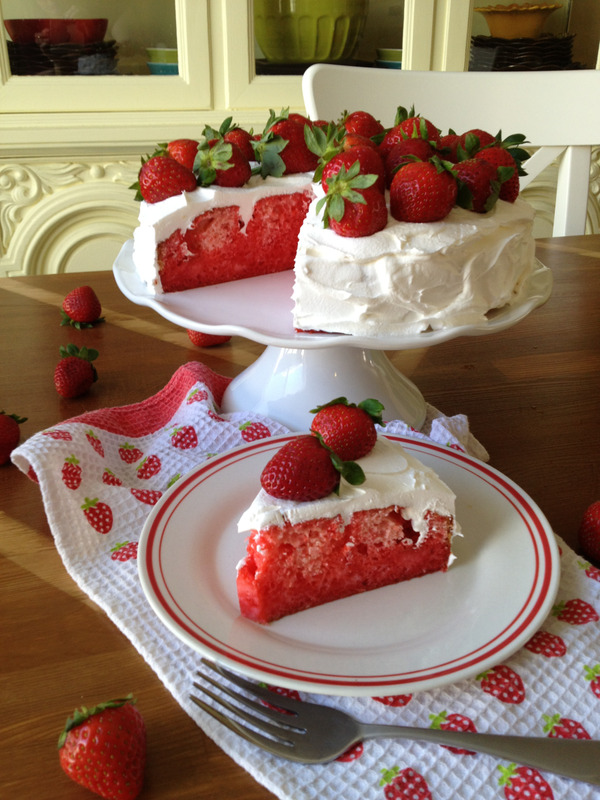 Bake this strawberry cake in a spring form pan. Once the Strawberry Jell-o sets, it likes to gently stick to the bottom of your dish like a suction cup. Forget trying to pry it out of a standard baking pan without doing some serious damage to this cake. Line the outside of your cake dish with strips of wax paper to keep your stand looking pretty. Gently pull them out and toss them when you're finished frosting. Stir whip in container before frosting. 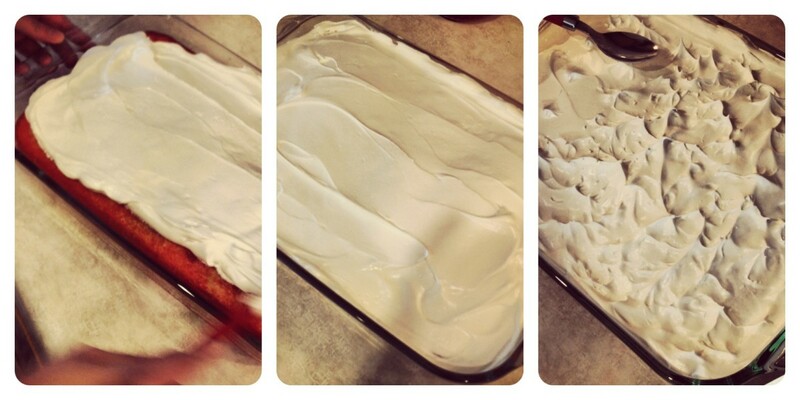 Dump most if not all of your frosting on top/middle of cake in a giant dollop and spread. This stops little cake crumbs from coming loose and traveling as you frost which makes your cake look crumby and messy. 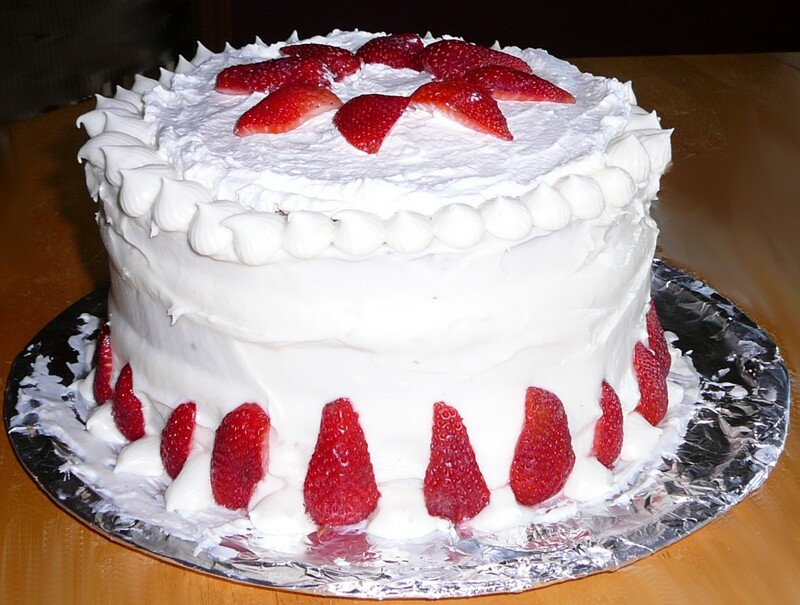 I like the rustic look I achieved with this cake by using whole strawberries with the leaves on. Make sure you wash and dry your berries thoroughly. Keep leftovers covered (or they'll dry out) and refrigerated (or your whip will melt). 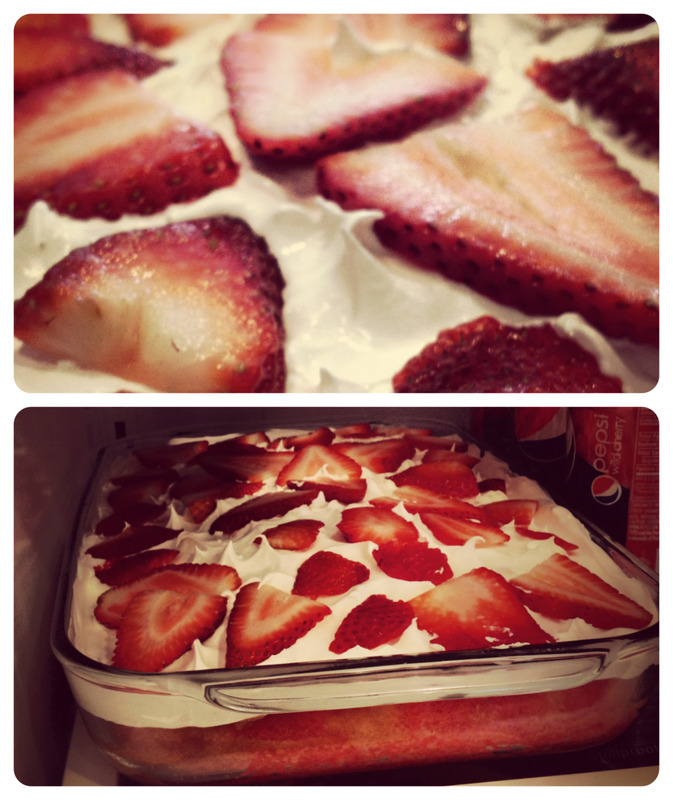 Heather Says: This is hands-down my favorite summertime desert. It tastes best once it's had a nice, long chill in the frig. Experiment with your own color and flavor combinations. Next time you want to make an amazing dessert but lack the prep time or fancy ingredients, make this Jell-o cake. Remember that the bulk of the time necessary for this cake is spent in the oven and frig, so you can prepare it in between cooking a meal or do it over the course of a day in between errands. You can't ruin it and it practically makes itself. If you're crunched for time, bake the cake the night before. Enjoy! Make homemade slushies using only 3 ingredients that you probably have in your kitchen right now. A delicious treat for summer that's fun, easy, and fast. Create your own unique flavor combinations! An easy no-bake dessert recipe that only takes 15 minutes but looks like a million bucks. Made with blueberries and raspberries, this is a great way to turn a child or picky eater onto eating berries. Make colorful and delicious popcorn for under $5. This is a snack that everyone will have fun making and eating. Includes pictures and video. 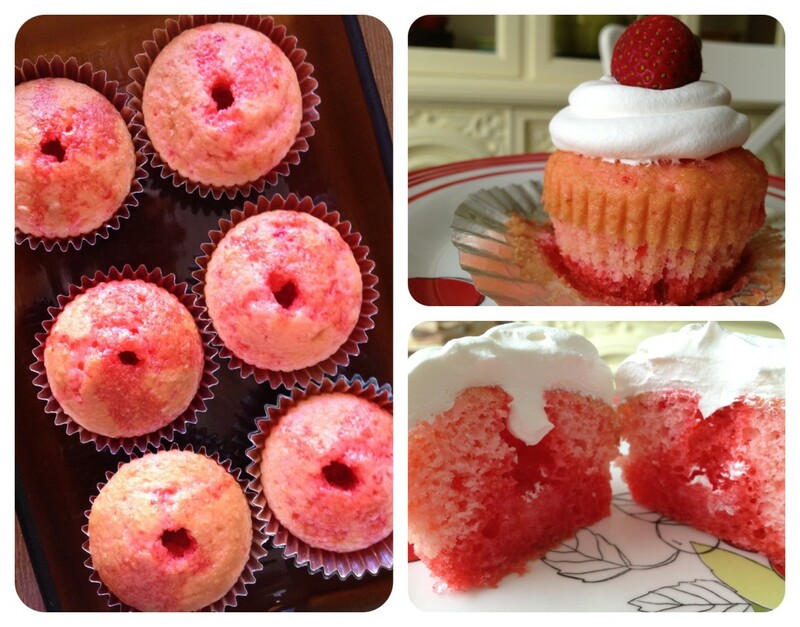 Love this recipe, the cakes look amazing and must be delicious, thank you for sharing. Yum. This looks delish. And, we get veggie gelatin here in the UK so I reckon I can give this a go! Thank you for the inspiration! Heather, this looks delicious! I love strawberries! That goodies are unbelievable. 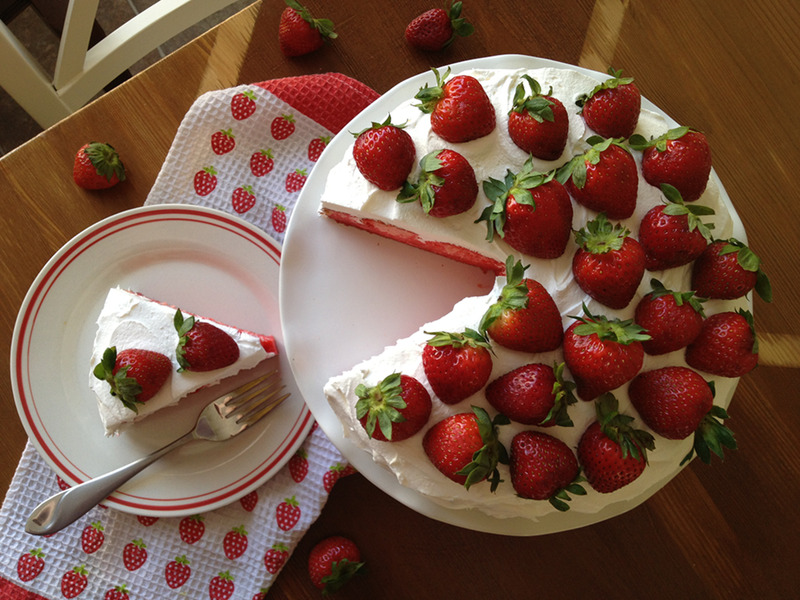 Fresh strawberries in cake are gorgeous. Thanks for sharing. This cake looks absolutely delicious. I will definitely have to try it. Up and awesome. Very nice recipe. Well explained. Good pictures. I have tweeted & pinned it. Voted up, marked it as Interesting & useful hub. Fantastic and beautiful hub, wonderful photos, and really helpful information. I'm ready to make this cake! Congrats on your HOTD; so deserving! Wow! Congratulations on HOTD. Well worth it. I think your beautiful photos alone deserve to win. Great recipe too! 5 years ago from Forestville M.D. I love strawberry shortcake but I feel that I want to make this recipe. It looks good. I've never heard of this cake before, but mmmm! Gotta try making it! Wow, this takes me back. I have not had Jello-O cake in so long. I remember when I used to request this as my birthday cake. Excellent hub. And congratulations on your Hub of the Day!!! 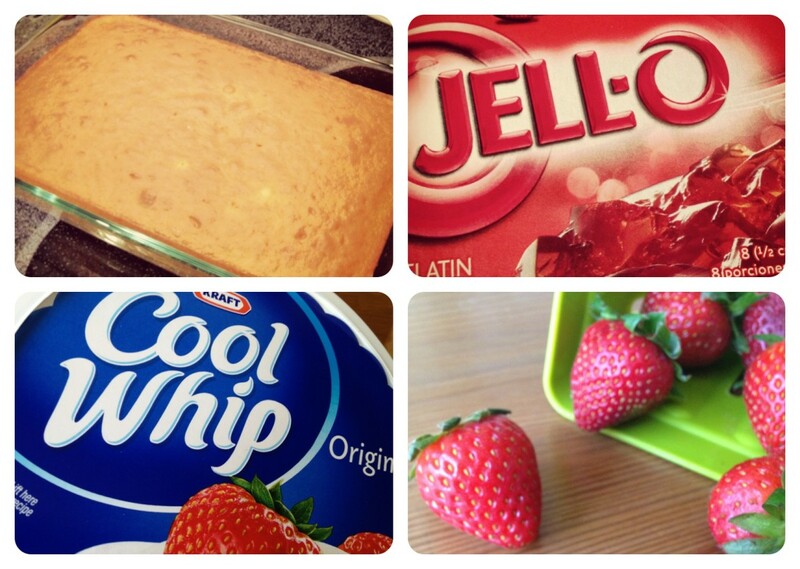 I made your strawberry Jell-o cake recipe this past weekend and it was yum-yum delicious! Thanks so much for sharing!! Amazing, this sounds so delicious! And the cakes are so beautiful:) Voted up, useful. These pictures really make me hungry. 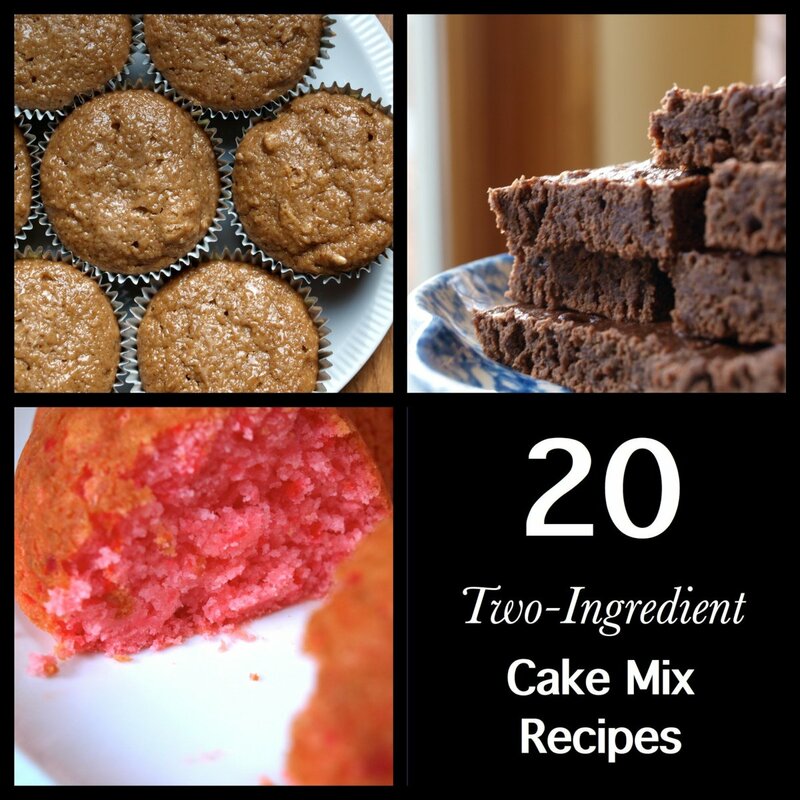 I love the combination of easy to make cake mix with the added Jello. I've wanted to try this recipe for a long time. People used to bring this dessert to social events and church dinners. just had some jello cake a couple of weeks ago for the first time. But it didn't look as good as this one. You put out such beautiful and well written hubs, Heather. Gorgeous cake! Congratulations on Hub of the Day! I don't even like things like this but I definitely would love to taste this because it looks so good ! Great cake recipe and brilliant hub! That beautiful cake prompt me to leave a comment here. Really awesome! What a GORGEOUS hub. I haven't made a jello/poke cake in a long time, and you certainly renewed my interest with this beautiful hub. The creative formatting and use of excellent photos is a model for us all. Pinning this! This is so tempting and the colors look gorgeous! Nice pictures and beautifully done hub! Okay so I haven't had breakfast yet and this is all I want to eat now. 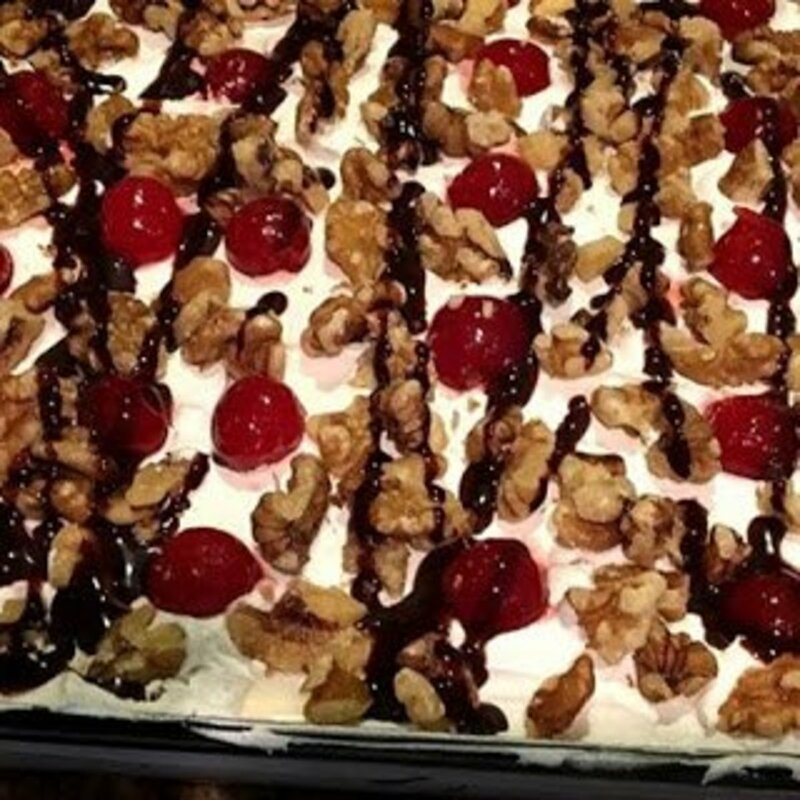 Just seeing the picture of this highly delectable treat from heaven told me you deserved HOTD but your Hub is very well done too so...congrats on HOTD and thank you for this dessert that will soon be sitting on my counter top. I know it tastes as good as it looks, too! Thanks! And congratulations on HOTD! Gorgeous. I've made Poke Cake before, but never had one turn out that beautiful. Now I will have to try again. And I'm not easily inspired to try making desserts! Great hub, lovely photos! Congrats on HOTD! Oh my word! That looks sooooooo good! Thanks for sharing The pictures are vibrant! I love strawberries! Voted up Beautiful! Thanks for sharing the recipe. I would not be able to make the cake as perfect as yours, but will surely try soon. Pics are simply delicious, Yummy Hub! Thank you for these very good ideas. It is winter now here in South Africa and a cold cake will not be too nice, but come summer I am going to try your ideas, especially make a colourful Christmas cake as Christmas here is hot, hot, hot. I have been making poke cakes with sugar free cake mixes, sugar free jello, and sugar free cool whip. I also add fruit for garnish that tends to be lower in carbs. Looks great. I loved all the photos of different ways to make this dish. I can't decide if I want to do cupcakes or a round cake. Yummy! Voted Up! Wow! I would like to have a piece of this now. I´m sure it´s yummy. I can imagine how your hubby waited with a pork in his hand to dig in. LOL! Thanks for sharing. Voted up and useful. Have a nice weekend! This is an awesome Hub. When I dream about HubPages, this is what I want it to be. Thanks for the awesome contribution. Wow. This cake looks awesome. Thank you for sharing. Really a WOW! outstanding recipe! This is sinfully tasty. Great recipe. The photos look so delicoius!!! Voted up. Great hub!clear pictures and good layout, as well as a good recipe. Well done! This is the first time I've seen something like this and it looks absolutely devine! YUM. I am SO going to try this sometime soon. You did an excellent job on this hub Heathersays! Thumbs up. Yum. I haven't had a jello cake in ages. And I have never had one topped with these delicious looking berries. I will have to give this a try. Thanks for sharing this. Beautiful Heathersays! This looks so yummy, pretty, and easy to make. I love the pictures you provided. Voted up, useful, and beautiful!